Raychem zero halogen hot to contract sleeve pipe pass UL test in order to 100%, conform with UL VW-1, 224 norms, UL file number is E35586. Divided into two kinds of heavy walls and thin walls, is it able to bear voltage 600V and 300V two to have 125 more heat-resisting, for have now hot to shrink sleeve pipe only zero halogen and in common use UL environmental protection sleeve pipe of authentication. 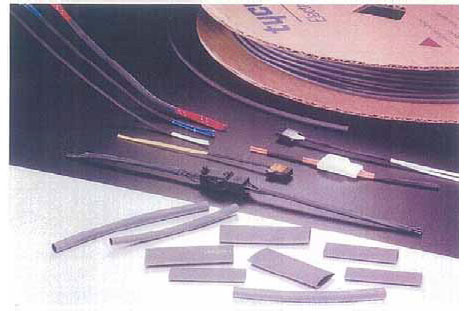 This specification covers the requirements for halogen–free, flexible electrically insulating, extruded tubing whose diameter will reduce to a predetermined size upon the application of heat in excess of 90°C (194°F). The tubing is essentially free of halogens. ZH2, a standard wall, 600 V, 125°C, VW-1 rated, UL recognized tubing meeting the requirements of UL 224. ZH2 also meets the requirements of Standard C22.2 No. 198.1 and is CSA certified. ZH4, a thin wall very flexible, 300 V, 125°C, VW-1 rated, UL recognized tubing meeting the requirements of UL 224. ZH4 also meets the requirements of Standard C22.2 No. 198.1 and is CSA certified with a 150 V rating. The tubing shall be essentially halogen free and fabricated from thermally stabilized, flame retarded, modified polyolefin and shall be crosslinked by irradiation. It shall be homogeneous and free from defects, pinholes, bubbles, seams, cracks and inclusions. The tubing shall meet the requirements of Table 3. The tubing shall be available in black. Qualification tests are those performed on tubing submitted for qualification as a satisfactory product and shall consist of all tests listed in this specification. Qualification test samples shall consist of 15 m (50 feet) of tubing of the size and color specified. Qualification of the 1 mm size of ZH2 to all properties and the 25 mm size to dimensions and flammability will qualify all sizes of ZH2. Qualification of the 1 mm size of ZH4 to all properties and the 10 mm size to dimensions and flammability will qualify all sizes of ZH4. Acceptance test samples shall consist of not less than 5 m (16 feet) of tubing selected at random from each lot. A lot shall consist of all tubing of the same size from the same production run and offered for inspection at the same time. Unless otherwise specified, tests shall be performed on specimens which have been fully recovered by conditioning in accordance with 4.3.1. Prior to all testing, the test specimen (and measurement gauges, when applicable) shall be conditioned for 4 hours at 23 ± 3°C (73 ± 5°F) and 50 ± 5 percent relative humidity. All ovens shall be of the mechanical convection type in which air passes the specimens at a velocity of 30-60 m (100 to 200 feet) per minute. Three 150 mm (6 inch) specimens of tubing, as supplied, shall be measured for length, to an accuracy of ± 1 mm (±1/32 inch), and inside diameter in accordance with ASTM D 2671. The specimens then shall be conditioned for 3 minutes in a 200 ± 3°C (392 ± 5°F) oven, removed from the oven, cooled to 23 ± 3°C (73 ± 5°F), remeasured for length, inside diameter and wall thickness in accordance with ASTM D 2671. The tensile strength and ultimate elongation of the tubing shall be determined in accordance with ASTM D 2671 using 25 mm (1 inch) bench marks and a 25 mm (1 inch) initial jaw separation. The speed of jaw separation shall be 500 ± 50 mm (20 ± 2 inches) per minute. The secant modulus of the tubing shall be tested using tubing as supplied in accordance with ASTM D 2671. Three 150 mm (6 inch) specimens of tubing shall be slipped over a snug fitting, straight, clean and bare copper conductor. For tubing sizes 1/4 and smaller, a solid conductor shall be used; for tubing sizes 3/8 and larger, a solid or tubular conductor shall be used. The specimens on the conductors shall be conditioned for 24 hours in a desiccator or similar humidity chamber at 90 to 95 percent relative humidity and 23 ± 3°C (73 ± 5°F). Three specimens shall be conditioned for 7 days in a 158.0 ± 1.0°C (316.4 ± 1.8°F) oven. After conditioning, the specimens shall be removed from the oven and cooled to 23.0 ± 3.0°C (73.0 ± 5.0°F). The copper conductor shall then be removed from the tubing, the tubing and conductor shall then be examined. Darkening of the copper due to normal air oxidation shall not be the cause for rejection. The tubing then shall be conditioned at room temperature for 16 to 96 hours and tested for ultimate elongation in accordance with 4.3.2. The dielectric strength of the tubing shall be measured under oil in accordance with ASTM D 2671. Five 150 mm (6 inch) specimens of tubing shall be recovered over a metal mandrel by conditioning for 3 minutes in a 200 ± 3°C (392 ± 5°F) oven. The mandrel diameter shall be slightly larger than the fully recovered inside diameter of the tubing being tested. The metal mandrel shall serve as one electrode and a 25 mm (1 inch) wide strip of metal foil wrapped around the outside of the tubing as the other electrode. The test voltage shall be applied at a rate of rise of 500 volts per second. Thickness measurements for calculating dielectric strength shall be made adjacent to the point of breakdown. Specimens for dielectric withstand shall be held for 60 seconds at 2500 volts. Three specimens of tubing shall be tested for copper contact corrosion in accordance with ASTM D 2671, Procedure B. Three specimens shall be conditioned for 7 days in a 158.0 ± 1.0°C (316.4 ± 1.8°F) oven. After conditioning, the specimens shall be visually examined for evidence of corrosion. Determine the halogen content (fluorine, chlorine and bromine) of the tubing by any suitable elemental analysis technique capable of measuring each halogen to +/- 50 ppm or all three halogens together to +/- 100 ppm. Failure of any samples of tubing to conform to any one of the requirements of this specification shall be cause for rejection of the lot represented. Tubing which has been rejected may be replaced or reworked to correct the defect and then resubmitted for acceptance. Before resubmitting, full particulars concerning the rejection and the action taken to correct the defect shall be furnished to the inspector. The tubing shall be supplied on spools, unless otherwise specified. Packaging shall be in accordance with good commercial practice. Each container of tubing shall be permanently and legibly marked with the size, quantity, manufacturer's identification, specification number, product designation and lot number.